A few national polls showing Donald Trump beating Hillary Clinton in the general election have many on the Left in full panic mode. To be sure, Trump presidency is an alarming possibility, but, for a number of reasons, they ought to be concerned, but not panicked. At the same time, there are some reasons for concern. I discuss each. 1. Trump isn’t really winning. It’s just a few polls out of many. Most poll aggregators including Huffington Post and FiveThirtyEight have Clinton up by 1 or 2% (RealClearPolitics is an exception, showing Trump with a slight lead). And while national polls on Election Day are fairly predictive of Electoral College results, these polls aren’t aggregated state-level polls that would allow us to build a full-fledged model. We just don’t have enough polls yet. Moreover, candidates almost always get a short-lived bump after wrapping up the nomination. 3. The party will unite. We’re probably looking at Clinton’s low point. Four weeks ago, the Republican Party looked to be in disorder compared to the relatively united Democrats who were having a love-in primary. Now, the GOP is slowly coalescing around Trump and the primary between Hillary and Bernie has turned pissy. But several things will likely happen once Hillary wraps up the nomination formally and accepts the nomination at the Democratic convention. First, Obama, who has high favorables with Dems and independents, will endorse and campaign for Clinton. Second, the Bernie supporters will come around. Not all of them, but most. Right now, depending on the poll, 55-60% of them say they will support Clinton. According to Nate Silver, if that number increased to 75%, Clinton would immediately be up by 4-5% in the national polls. That 75% figure is well below the comparable figure in the past. The Dean supporters came around, the Clinton supporters came around. It happens every time. 4. Most people aren’t paying attention. Do you know that 18% of independents have never heard of Bernie Sanders and another 12% have no opinion of him? If you’re reading this post, you are a weirdo. Normal voters aren’t paying attention to Trump’s outrageous comments. They don’t know about Bernie Bros or the Nevada convention. They’re not paying attention. So, sorry, journalists and their political junkie readers who need a new dose of drama every day, you just have to wait. 1. A third is still a lot. The betting markets have Clinton’s implied probability of winning at 66.67%. In other words, if this election played out three times, we’d expect Trump to win once. There’s a one in three chance that a major earthquake with hit the Pacific Northwest in the next 45 years. If I lived there, I’d be worried and buy insurance or move. 2. Republican dominance. I’m fairly confident that Clinton will win, but if she does, she will still probably face an obstinate and extremist Republican House, majority Republican governors, and Republican control of most state legislatures. GOP control ain’t going away. 3. A real fissure. Trump is the candidate who launched a thousand thinkpieces about the breaking up of the Republican Party. Some have suggested that the same is happening with the Bernie contingent and the Democratic Party. That’s wrong. Bernie – whatever he may say about socialism – is a conventional Democrat, just further left. Most Hillary supporters say they’d vote for Bernie. By contrast, Trump breaks the conventional spectrum on the Right. Is he a moderate? A radical? He’s disavowed by some party elites (e.g., the Bushes) in a way that Bernie just isn’t (despite his seeming death feud with Debbie Wasserman-Schultz). So, who would break the spectrum on the Left? Ross Douthat told Ezra Klein that he thinks it would be someone like a BlackLivesMatter candidate. Identity politics have already demonstrated their capacity to divide traditional liberals and activists who use more radical rhetoric and approaches to addressing racial and gender inequality. The debate about P.C. culture on campus represents this divide in microcosm. What if there were a candidate who could tap into not only the youth vote (like Bernie has), but also draw people of color and women in mass numbers away from an establishment Democrat like Clinton? What if that candidate talked about race injustice in language that the Chuck Schumers of the party felt compelled to condemn? For those invested in the Democratic Party, a candidate who took a more radical approach to race and gender could produce a real fissure. Depending on one’s orientation, that might be a cause for concern or a reason to celebrate. However, I suspect such a candidate would have about the same odds with the general voting public as Trump. To summarize, worry about the big picture and what it means for policy. Don’t sweat the polls for at least two months. Influence of the Blues and Foxes? Guest Post by University of Minnesota graduate student and friend of the blog, Ryan Larson. See the more lovely pdf version here. When reading my esteemed colleague (and former official, and current satellite-unofficial, advisor) Andrew Lindner’s post on the shift in buying power in English Premier League teams, my interest was sparked by one of his last propositions: “It may just turn out that 2015/16 was an outlier season and that the clubs with the deep pockets will buy their way to success again next season.” In order to adequately evaluate this claim, data from the coming seasons would be needed. However, we can assess whether the 2015-2016 break in the “buying wins” trend is due to a few influential points. In other words, do a small number of teams disproportionately account for the change in trend? 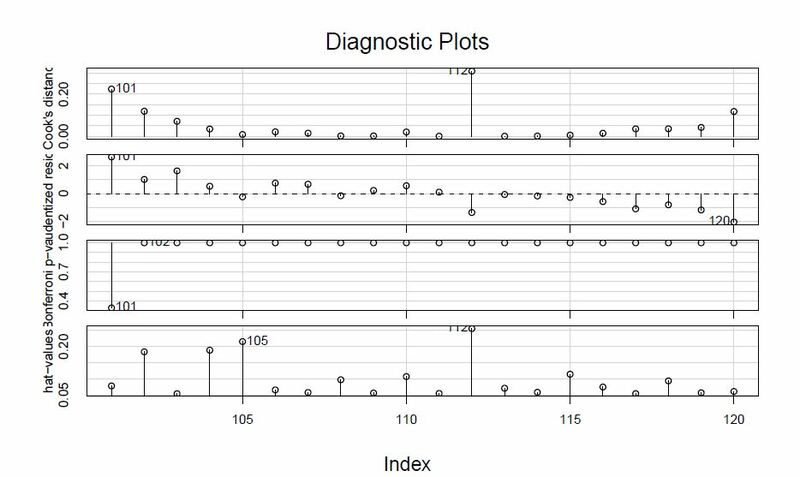 After replicating Andrew’s data manipulation and models, I looked at some influence regression diagnostics, namely Cook’s Distance. In a nutshell, Cook’s Distance measures the change in a regression coefficient when an observation is deleted. The following plot shows influence indicies for each point in the 2015-2016 model, and indicates that points 101 and 112 are statistically influential: Leicester City and Chelsea. In accordance with the high Cook’s Distance values, I removed Leicester City and Chelsea from the 2015/2016 model. Although the downturn of money-flush Chelsea and the success of relatively pauperized Leicester City are influential, they in themselves do not account for the break in the trend. 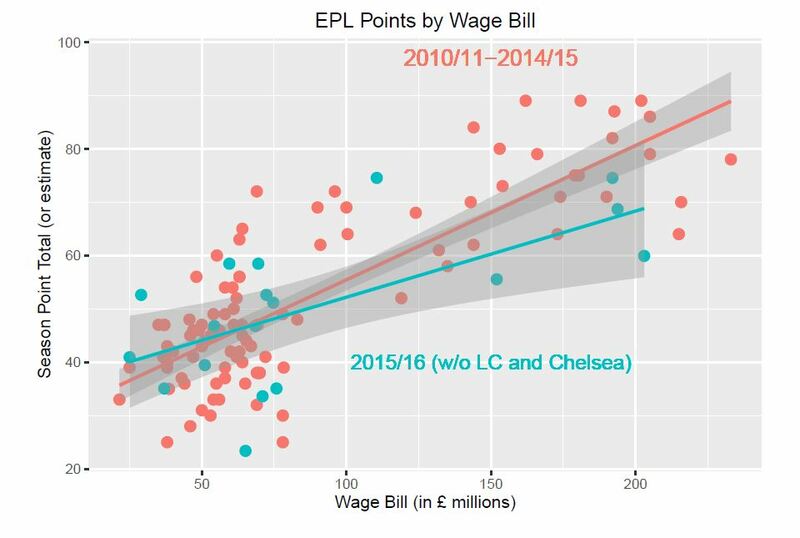 In terms of the trend Andrew is noting, the correlation between wage bill and points in the 2010/2011-2014/2015 seasons is .81, and the correlation (with estimated points) in the current 2015/2016 season is .43 – indeed a marked difference. But even after removing Leicester City and Chelsea, the correlation in the current season is .64. In other words, wage bill is still giving teams less point return as compared to previous seasons, even after the removal of Chelsea and Leicester City (see updated plot below). This strengthens the assertion that the diminishing power of deep pockets is an overall trend (at least for this season) as opposed to just the disproportionate influence of two wildly performing teams respective to their piggybanks. Arsenal’s victory with a breathtaking extra time goal by Danny Welbeck this past weekend notwithstanding, Leicester City’s season has had the kind of storyline we normally only see in Hollywood movies. This isn’t a March Madness Cinderella team upsetting Duke in a one off win. Leicester is a team with a wage budget less than a quarter of the size of the league favorites. Leicester finished 14th in the English Premier League last season. Leicester’s leading scorer this year, Jamie Vardy, had 5 goals in 36 matches last season. Closest thing in US sports to what Leicester is doing? The movie Hoosiers. But just how unusual is this season? Very. Compared to the socialist sports leagues of the United States with their strict salary caps, the EPL is the Wild West where top teams can pay players as much as their owners are willing to spend. It has led to massive inequality between clubs with four teams spending at least £100 million more in player salaries than most of the rest. 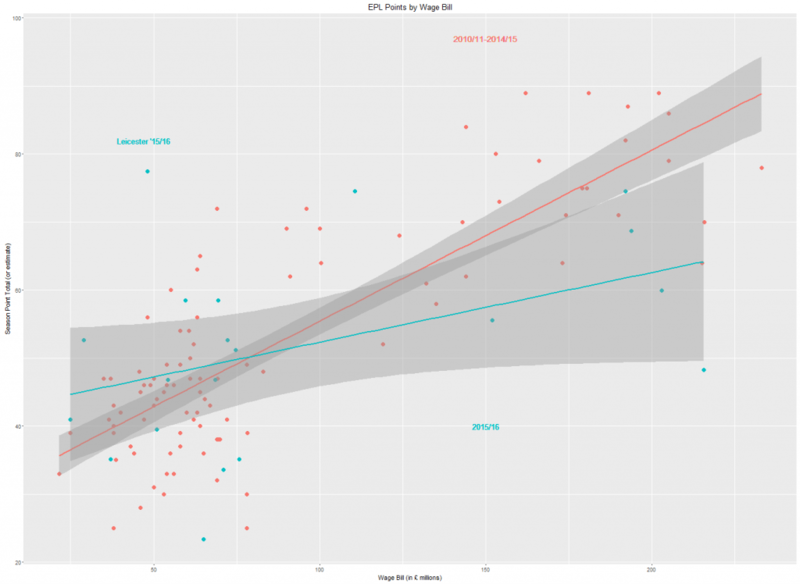 Unsurprisingly, it is usually the case that clubs that pay for better talent do better. Taking data on club wage bills and season point total from the past five years¹, I produced the figure below that charts the relationship between spending and success for the four campaigns from 2010/11-2014/15 in red (with some assistance from my Skidmore colleague, Michael Lopez, who has studied salary and wins in MLB). In a normal season, £25 million in additional wage spending is worth about 6 points (or two wins). Moreover, team simply do not join the rarefied club of 75+ points in a season without a wage bill north of £140 million. This season broke that (see the blue points). The aristocrats were deposed (well, at least Chelsea and Liverpool). Southampton and West Ham are in positions to win Champions’ League spots. As of writing, positions 5 and 14 on the table are separated by only 3 wins. This season, £25 million in additional wage spending is worth about half a win. And, well, Leicester … as NBCSN commentator Peter Drury exclaimed during Leicester City’s victory over Manchester City, “They’re not just beating the richest club in the land! They’re rippin’ them on their own patch! Why shouldn’t they be champions?” As the figure show, Leicester of this season is an unbelievable outlier. Over the past five years, the next closest club with a wage bill under £50 million had 22 fewer points (7 wins)! What explains the wilting effect of wages on points? It’s easy for the punditocracy to come up with individual accounts. Leicester’s success is due to its “team spirit and togetherness.” The seeds of Chelsea’s unprecedented misfortunes were visible in their low-scoring title year last season. But the truth is that even the data-equipped are grasping for answers. It may just turn out that 2015/16 was an outlier season and that the clubs with the deep pockets will buy their way to success again next season. For now, let’s just enjoy the competitive balance and hope that Leicester can win a title for underdogs everywhere. ¹Because the current season is still underway, I estimated this season’s final point total based on current standings.